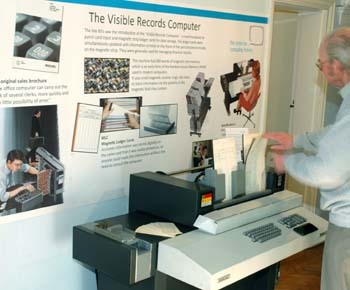 One of Haverhill’s hidden treasures until now, the Centre for Computing History has been established to create a permanent, public exhibition that tells the story of the ‘Information Age’. At the core of this ambitious project is an internationally significant collection of computers, related artefacts, memorabilia and associated materials that already exists in the town. As well as preserving and displaying this IT heritage, the museum will demonstrate the computing industry’s unique contribution to the world and will showcase the social, historical and contemporary impact of the computer. The museum is the concept of local businessman Jason Fitzpatrick who has been amassing an exceptional collection of vintage computers and related artefacts over a period of some 20 years. Now a number of Haverhill business people, including Nic Rumsey of Haverhill Business Park, have got behind the initiative to push it forward. A steering committee has been formed, a website has been launched, emails have been pouring in from across the UK, Europe and America and the museum has its first interim home. Why Haverhill?. This group has all the answers, forcing sceptics to sit up and take notice. Museum spokesperson,, Elaine Collins explains: “Haverhill is a prime location for this venture. For a start, we have the core collection here. Secondly, the town has been frequently identified as an area lacking any substantial heritage provision. Thirdly, Haverhill’s proximity to Cambridge and the shared locale contribute massively to its appeal. Charles Babbage, widely known as the ‘father of computing’, read Mathematics at Trinity College, Cambridge. Cambridge was also home to Acorn Computers, developers of the BBC Micro, and Sinclair Research, creators of the famous ZX81 and ZX Spectrum computers. Today, Microsoft’s UK state-of-the-art research facility is based in Cambridge. With over 1500 items, the collection features historic machines like the Altair 8800, the first home computer also directly responsible for the birth of the computer industry, and other nostalgic machines like the Sinclair Spectrum, Commodore 64 and Atari 2600. As well as preserving vintage machines and memorabilia, the mission of the centre is to spotlight the people behind the inventions and record the information necessary to captivate and inspire future generations. At present the museum can only be viewed by appointment, but there are plans afoot to take some exhibits on the road with a series of displays at venues in and around the area later this year. Aimed at everyone from children to academics, an inventive multimedia approach will offer visitors the opportunity to interact with many key machines, thereby promising a hugely entertaining experience. The centre’s fund-raising campaign kicks off later this year. However, a number of local organisations have already embraced the scheme and contributed valuable sponsorship. Word on the street says the ‘buzz’ is gaining momentum! Jason Fitzpatrick continues: “We have the support of over 20 organisations, including Samuel Ward Upper School, Haverhill Enterprise, Haverhill Town Council and the heritage departments of St Edmundsbury Borough Council and Suffolk County Council. We have also established links with the Bletchley Park Trust. Museum Manager, David Coxshall outlines the present public appeal: “Clearly, we need monetary donations to enable this very exciting initiative to proceed and to fill gaps in our collection. But, at this point in time we specifically need storage boxes, lights, plastic zip bags to archive exhibits, exhibition cases and exhibition materials to create displays. The website also provides information about how to donate to the museum’s current appeal and future fundraising campaign. Companies who may be interested in sponsorship opportunities etc should contact: Elaine on 01440 709794/01440 708494.